The Santropol Roulant Beekeeping Collective takes care of local hives, and is a small group of passionate beekeepers working with hives on urban rooftops in Montreal. Our mission is to maintain a healthy bee population, train new beekeepers, and connect urbanites to the source of their food. 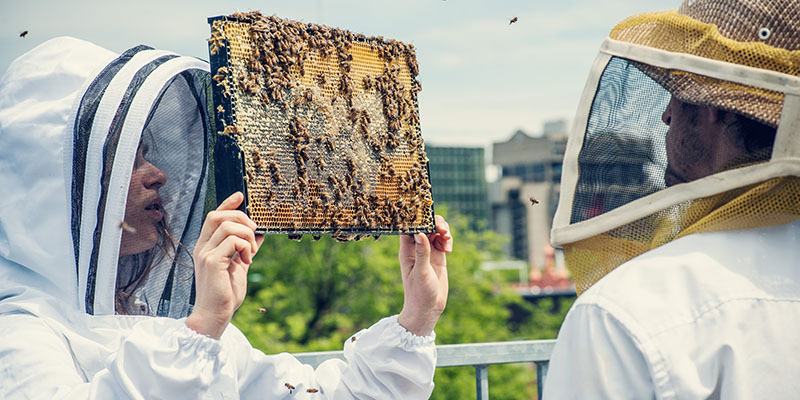 The collective’s 5 hives are located on the Roulant rooftop and on the Frank Dawson Adams building on the McGill campus. Of course, with new seasons come more hives, we’ll keep you posted! This form of organization implies that each member has equal power. The plurality of views is encouraged, and respect and listening is actively put into practice within the group. This, along with the rotation of responsibilities (facilitation, note taking, interventions) within the collective, ensures that everyone has their place, no matter their level of experience, level of education, language, age, gender, ethnic origin, political opinions or sexual orientation. Collective work is mainly a way to learn from others! Th Beekeeping Collective’s mission is to help spread sustainable, democratic, and local beekeeping practices. Santropol Roulant’s Beekeeping Collective is a grouping of beekeepers who come together to foster and uphold a sustainable and healthy culture of beekeeping within Montreal. As a collective of Roulant, we work to strengthen and nurture our local community by bringing together people from all walks (including members of the group) of the source of their food. 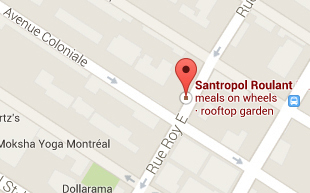 Our hives are located on the roof of Roulant (111 Roy East) and the Frank Dawson Adams Building at McGill University. 2) experienced and educated apicultures and aspiring beekeepers alike ensure that honey bees may find as much of an inhabitable environment in urban areas as in the wild. How do you select new members? To find out about the next call for submissions, we invite you to subscribe to our bi-monthly newsletter or follow us on our beekeeping blog. Who is involved in the collective ? The collective is made up of 14 members. Through the selection process, we aim to strike a good balance between new and experienced beekeepers, men and women, and Anglophones and Francophones. Each person has their place in the collective, regardless of their level of experience, level of education, language, age, gender, ethnic origin, political opinions or sexual orientation. Do you only accept candidates with prior beekeeping experience? There is no need to have experience with bees to be part of the Santropol Beekeeping collective. While some members will bring expertise and knowledge about beekeeping, others will learn about it for the first time! What does involvement in the collective entail? staying in touch with other members of the group through the collective’s mailing list. Can I visit the hives? From time to time we organize beekeeping workshops and hive tours, for example during our big summer events. We do not offer private hive tours but please note that our rooftop hives located at Santropol Roulant’s building are accessible for the public during opening hours from Monday to Saturday, 9:30am to 5:30 pm. Do you sell your honey? Our honey is put up for sale following the extractions sessions (usually at the beginning and end of summer). It can be purchased at the Roulant’s farmer’s market and office (111 Roy East). Announcements are sent via the Roulant newsletter. Which plants and flowers are in the honey? A honey analysis performed in 2012 revealed that honey from the McGill hives was composed of over 50% apple pollen. It also found (in smaller amounts) mini willow, buckthorn, raspberries or blackberries, staghorn sumac, pennsylvania cherry, trefoil, maple or red plane, ash, and more for a total of 17 plants! 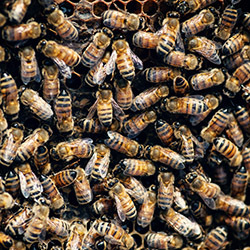 How is the Beekeeping collective financed? The collective is financially independent. The working budget comes primarily from the sale of honey and fundraising events. Why get involved in urban apiculture?